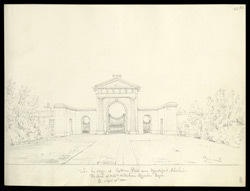 This drawing shows the Lodge at the entrance to Tatton Park. The estate is set in over 1000 acres and was home to the Egerton family for nearly 400 years. During Buckler's time, Tatton's formal gardens were revered throughout Europe and visited by many, just as they are today.